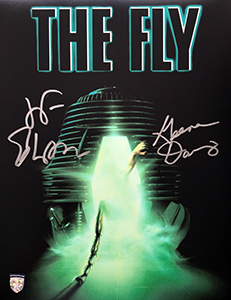 11x14 The Fly photo signed by Geena Davis in July of 2018 during our private signing in Marina del Rey, CA and Jeff Goldblum in August of 2018 during our private signing in Boston, MA. Comes with our numbered hologram COA sticker for authenticity. © 2019 C2 Ventures, Inc. All rights reserved.